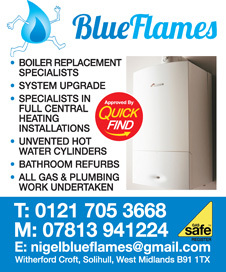 BlueFlames are a local Gas Safe registered business specialising in all aspects of gas, heating and plumbing in Shirley, Olton, Solihull and surrounding areas. Vetted and approved by Quick Find directories. "Very helpful and informative, done all the work to a good standard and cleaned up before leaving. I am very imprssed with the service Nigel provided and would not hesitate in referring to family and friends." "Nigel recently transformed our sage green bathroom. The result exceeded our expectation. He is a very pleasant tidy workman but more importantly the quality of the workmanship was 1st rate."